Bruno Clair is one of, if not the finest, "under the radar" producer in Burgundy. 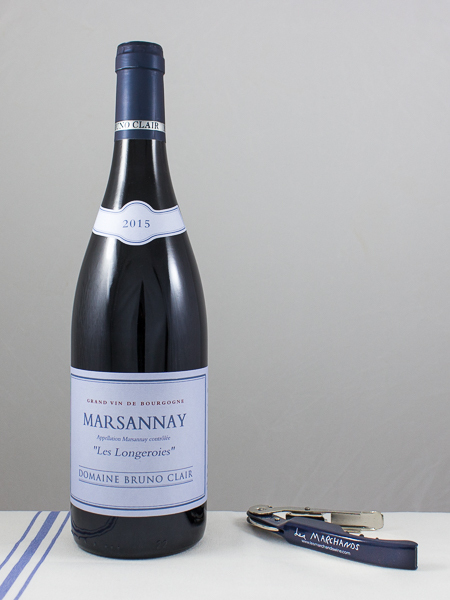 2015 was a stellar year for Burgundy quality but unfortunately there was not a lot of it. Quantities are very limited. Bruno Clair, and winemaker Philippe Brun, describe 2015 as a "surprisingly easy vintage to manage from the standpoint of the growing season as there wasn't much disease pressure, no hail and no Suzukii flies. Really, about the only thing that caused concern was how dry it was given the high heat. The flowering was incredibly fast and while it passed reasonably well, there was some shatter. We began picking the whites on the 4th of September and attacked the reds on the 6th. The fruit was super clean and thus we were able to harvest very quickly. Moreover the stems were perfectly clean and ripe and thus we used roughly 30% whole clusters for the vinifications. In fact about the only aspect that one could have wished to change would have been to have better yields. It usually requires between 300 and 325 kilograms of fruit to make one barrel of wine but in 2015 it required 350 to 360. While it would not be accurate to describe 2015 as having low yields, it was still a vintage that gave us lower than average volumes. Overall, 2015 is a vintage of the sun but one that is much more Burgundian in character than say 2003 or 2009." I would echo the comment that the Clair 2015s are wines that are creatures of their vintages but at the same time they are pure and fresh and each terroir is reasonably well-defined. They are also wines of impressive quality and this is especially true at the higher end of the appellation hierarchy. The 2014s revisited below were bottled in May 2016 and I would further observe that they too are very much worthy of your interest. Lastly Clair noted that the Bonnes Mares lease agreement with Fougeray de Beauclair (see herein) has ended and thus the domaine will now possess a remarkably 1.6 ha on the Morey side."